The start of the race was frantic, with three lead changes on lap 1 alone. Mark Webber in the #20 took charge on the exit of turn one, before Buemi and André Lotterer slipped by. Lotterer’s brief spell in the lead would be short lived however, as using up his fuel allowance forced him to slow down on the pit straight and let most of the LMP1 field through. “I forgot what car I was driving, so I had to back off,” he said afterwards. After that it was a duel between the two Toyotas of Buemi and fan-favourite Kazuki Nakajima and the #20 Porsche during the opening laps. But Webber would have to bring in the 919 for an un-scheduled stop for a slow puncture. “It was unfortunate, so we decided to gamble and double stint the tyres early, but it didn’t work. There wasn’t a lot of grip out there,” explained the Aussie. Webber briefly gained the lead again after the next pit cycle, but despite setting what was the fastest lap of the race until the very end, their pace wasn’t consistent enough for either of the Porsches to keep up with the Toyotas. A couple of small errors under braking also cost the Porsche crew as Webber scrapped with the Audis while running out-of-sync. The #20, which looked good for a win early, never recovered, and both cars from Weissach suffered power issues at various points. 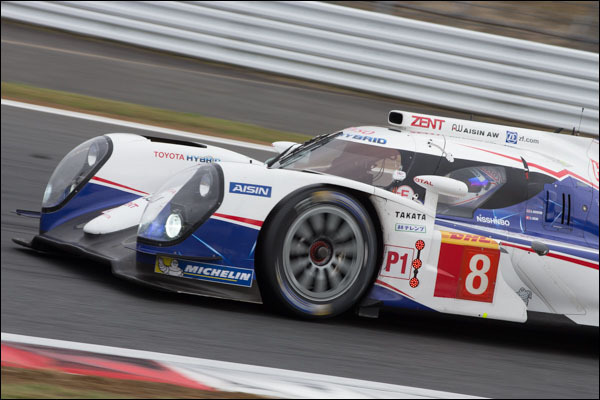 Audi failed to challenge the two Toyotas also. Straight-line speed, or lack of it, was the story of their race. Being quick round the corners and rapid in the pits wasn’t enough to make up for their woeful top speed down the pit-straight, with both R18s getting blown away by the other marques multiple times throughout the race. 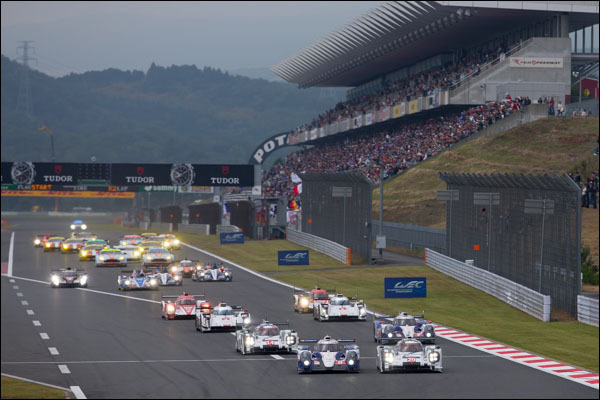 It turned into a patient run to the flag after the first hour was over for the Toyota crew, as both sets of drivers put in faultless performances in front of the ever enthusiastic Japanese crowd. Even at the end, Davidson was lapping 4 seconds a lap faster than the Audis while they scrambled to try and secure a podium spot. Audi tried to double stint tyres at the end like they did in the first hour, but that didn’t help their cause, the Michelin rubber was unable to hold up over the course of two stints and they couldn’t gain on the two Porsches ahead. 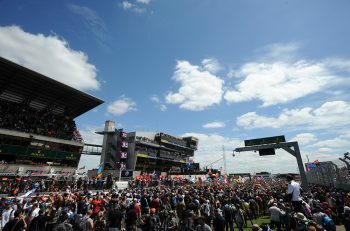 It was a forgettable day for Audi Sport, the #2 and #1 finishing 5th and 6th respectively. 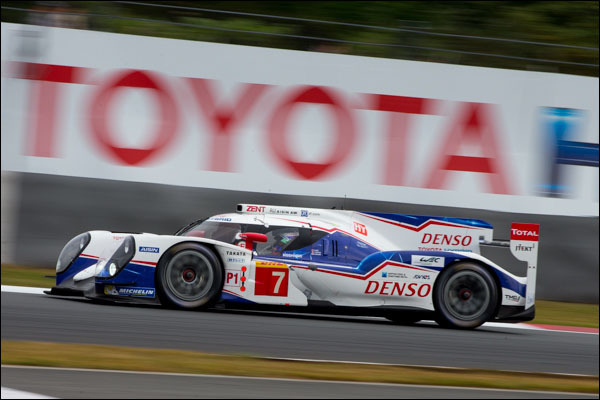 “We want to run a ‘boring’ race, a run without problems,” joked Anthony Davidson, and that’s exactly what happened. Rebellion Racing took a win in the LMP1-L class, the #13 dominating after the team’s #12 R-One experienced various mechanical niggles throughout. Lotus’ new car still clearly needs more time, as it lacked the speed to challenge the Swiss outfit, and failed to finish too. A huge fire in the pit-lane with Christophe Bouchut driving ended their race prematurely. 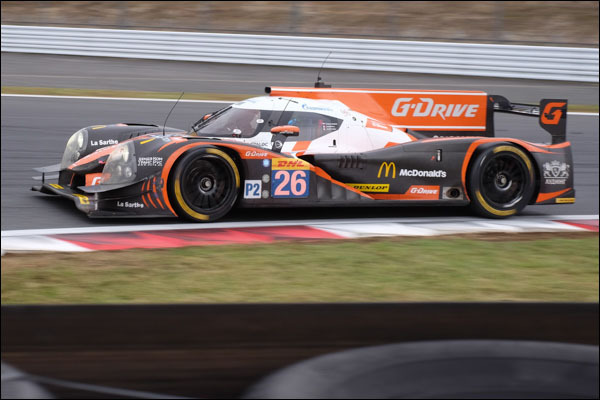 LMP2 boiled down to Olivier Pla in the #26 G-Drive Ligier and Alex Imperatori in the KCMG Oreca. At the beginning and end of the race, the duo provided some heart-stopping battles, as they squabbled for the class lead. In the end though, G-Drive would prosper after a late scare. With 26 minutes to go and with a lead of 45 seconds, the team had to make an un-scheduled stop to change a single tyre, allowing Imperatori to take the lead. Olivier Pla wasn’t finished though, and dived up the inside of the Swiss driver at the hairpin a few laps later to secure the victory in the closing minutes after dicing through traffic. It was a great run by Julien Canal, Olivier Pla and Romain Rusinov, denying KCMG from taking two LMP2 class wins in a row. 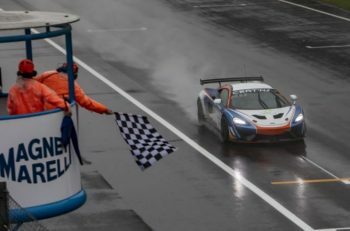 SMP had a sloppy outing, with both cars getting involved in incidents, allowing the #35 Oak Morgan of Alex Brundle, Gustavo Yacaman and Keiko Ihara to steal the final podium spot, much to the delight of team-owner Jacques Nicolet. 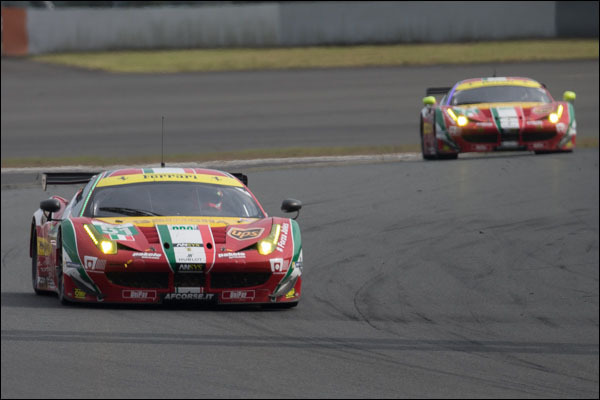 The GTE classes also saw dominant performances, as AF Corse scored a 1-2 in Pro and Aston Martin Racing achieved the same feat in Am. 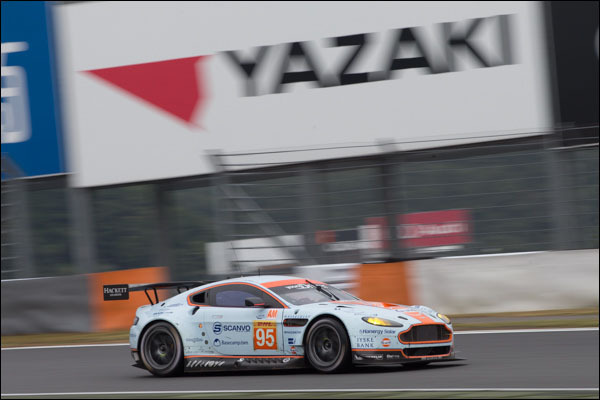 For the first third of the race it seemed the #99 Aston Martin would be the car to beat in Pro. A great stint early on by Fernando Rees saw the Vantage take the lead of the class ahead of the two Ferraris. The #97 would have surely entered the fray too, but contact at turn 1 on the first lap forced Stefan Mücke into the pits to repair the splitter, effectively ending the team’s chances of a good result. Gianmaria Bruni and Toni Vilander in the #51 would chip away at the Aston though, and despite serving two penalties, would take charge in the class by the end of the race. It was a great run by the #71 AF Corse 458 too, with James Colado driving extremely well, but team orders played a part here, so the Brit would follow his teammates home in second place. The #99 didn’t hold up on pace and needed to make one more stop than the Prancing horse entries, leaving Alex Macdowall to fend off the #91 Porsche to the flag. It was a tough day for Porsche, who just didn’t have the speed to challenge the rest of the class. Kristian Poulsen, Nicki Thiim and David Heinemeier-Hansson came home first in Am, followed closely by their teammates in the #98. Victory wasn’t in doubt from start-to-finish, as both Astons crossed the line race three laps ahead of their closet competition. Only the #81 AF Corse 458 looked to even remotely challenge them, but it retired shortly before the finish, handing Prospeed Competition the final podium position.